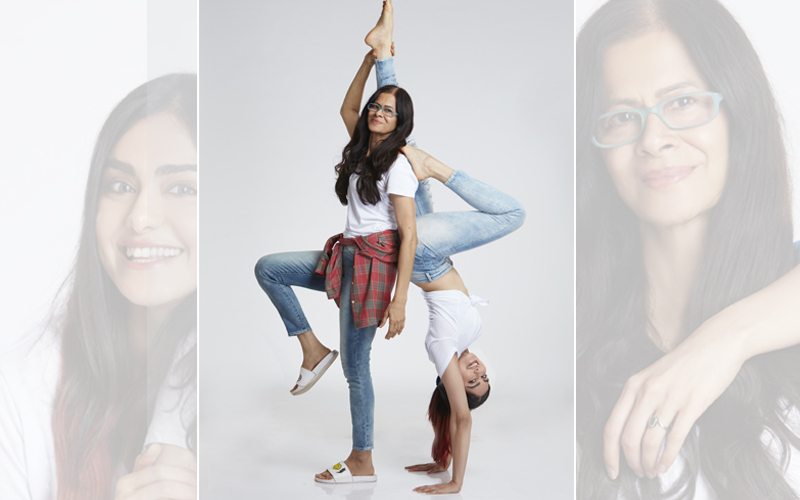 As someone rightly said, “A mother is she who can take the place of all others, but whose place no one else can take.” And actress Adah Sharma could not agree more. Her mother, Sheila Sharma is a classical dancer and yogini who performs Mallakhamb yoga, and together they’re like a house on fire. With Mother’s Day around the corner, we caught up with the mother-daughter duo for an exclusive tête-à-tête. Read on to know more about the bond they share. What bond do you share with your mother? A psychiatrist's delight! I'm stuck to her like glue (laughs). It's intangible and indescribable! We are so connected that we don't have to be in the same space to spend time together. I hang out with her when she's dancing or doing yoga; we sometimes watch sitcoms together, and when we are home at the same time we eat together. Is there any one quality you wish you had inherited from your mother? Her lean long waist and hamstring flexibility which she really works on... But I would like to inherit the flexibility without the hard work (laughs). She has a photographic memory and can memorise entire books! Is there a memory of your mother that is etched in your mind? She used to make very creative costumes for fancy dress competitions in school each year and I remember her stitching a skirt made of real straw, when I was egg-straw-odd-and airy (extraordinary). I thought that was super creative. We had fake eggs on my straw hat, I had different coloured shoes on each foot for 'odd' and balloons for airy (laughs)! Did you ever want to follow her footsteps and become a classical dancer by profession? I did follow in her footsteps and I am happy to say I am a classical dancer. I carry my ghungroos in my suitcase whenever I travel. I use my knowledge from dance in all my scenes in my movies. The main thing in dance is expression, and it really helps me in the subtle nuances in acting. What is the one piece of advice your mom has often given you that has played true? Travel the path that has not been taken. When something has been tried and tested and there is an almost guarantee that it will work out, don't do it. Have the guts to do something else. Be brave enough to be yourself and not a copy of someone else. Do you celebrate Mother's Day? Not really...actually we celebrate life, but this year we took these cool pictures for your cover and we had a lot of fun in doing so! What is it about Adah that makes you most proud? She can draw perfect circles without a compass and lines without a ruler or stencil (smiles). How do you react when your daughter has a successful film? We go out for pani puri, make homemade almond face packs, watch episodes of The Big Bang Theory and do a session of 100 cartwheels and surya namaskars to celebrate. We do the exact same thing, but this time as a stress buster. How did you react when Adah told you she wanted to become an actor? I was overjoyed! Whatever she does she does really well, so I was sure she would be great at this too. If left to you, what profession would you rather Adah had chosen? My daughter would be an excellent research scientist. But for now I will make do with her being a "Commando" girl and giving people a "Heart Attack" (laughs). Is there a memory from her childhood that is etched in your mind? I came home one day and she was painting our glass door with glass paints! She was nine years old and had planned to surprise me by doing this. Describe your daughter in four words.